The BIG secret with duck is drying it out like the Chinese do. If you don’t dry it you end up with that wet, tough, salty, nasty, oily greasy duck they serve you in wannabe french restaurants. The Chinese hang it up in the window for a few days, which is all very nice, but I hate to think of what the flies do on it in that time. Despite my englishness, this is a serious case of ‘n Boer maak ‘n plan – you marinade it and then you hang it in a biltong drier for a couple of days. Mellerware will sell you a biltong maker for R400 that has a fan and a light and it works and it’s easy – this will seriously improve your life. get one. 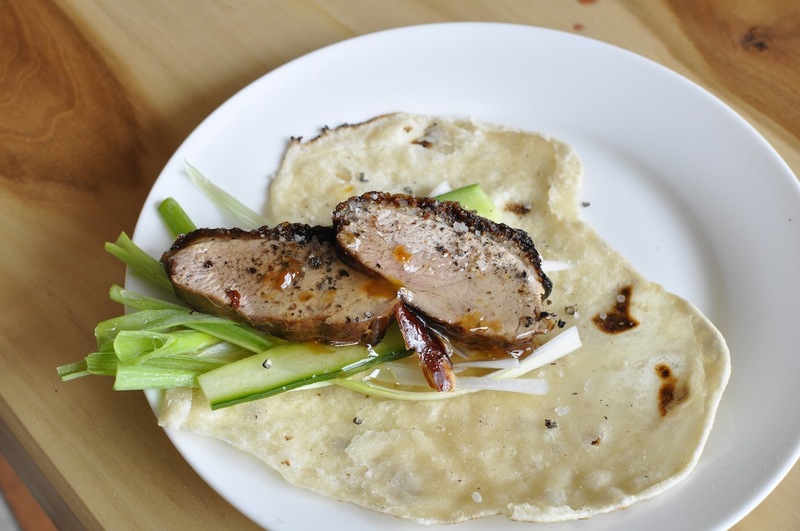 Peking Duck…. 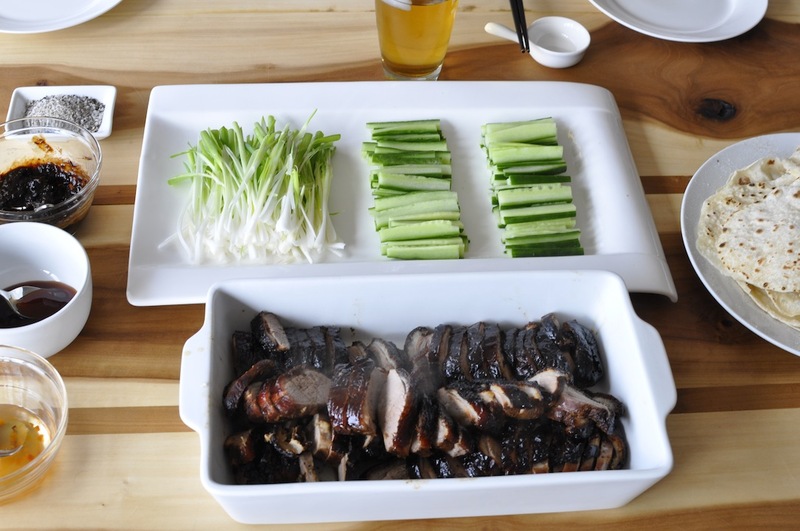 Gordon’s bay style… I kind of made this up from loitering in kitchens and restaurants and poring over various cookbooks over the years… It works, but it’s not really traditional Peking duck as it’s roasted – it’s better!! Usually I get whole ducks, 1 duck is enough for 3 people as a main course or 5 to 6 people as a starter. In this case I used 6 breasts (1.5kg) for 6 people, which is actually enough for 8 as a main course. As a starter 4 breasts for 6 people would be very generous. It’s very rich and high in protein, plus the condiments are a lot of food too. Reserve the marinade – place in the fridge. Overnight for breasts is… okay… ish. 2 days is better. For whole birds dry for 3 days if possible. The skin should have the feel of parchment when you are ready to cook them. Spring onions: cut away the roots and top so that each onion is about 100mm (4″) long. then slice them lengthways to make slivers. Put the hot water (250g) into the flour and mix well with a wooden spoon. Put in the cold water (85grams) and the teaspoon of sesame oil, and get your hands into it and work it until it’s a ball of dough. Put a wet tea towel over it and let it rest for 15 to 30 minutes. Take it out, halve it, and roll it into ‘sausages’ about 50 mm in diameter. Cut these in half and then divide each into 10 pieces – you want about 40 pieces all together. Roll each piece into a ball between your palms. 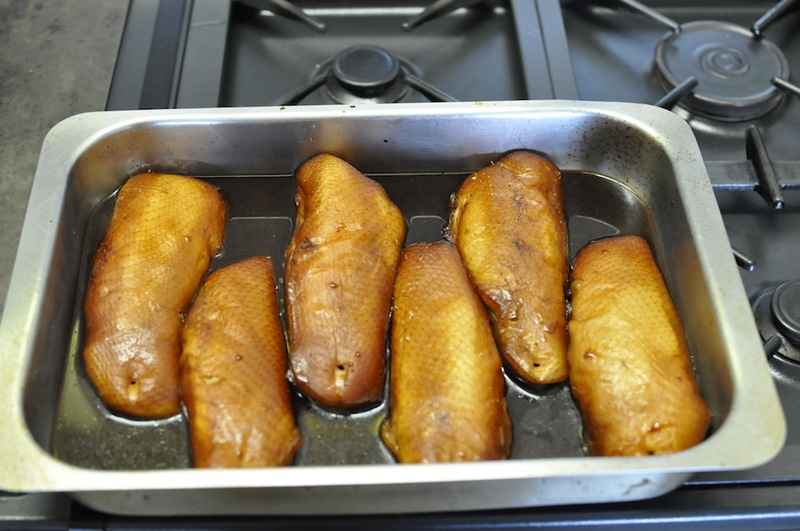 Before you start cooking them – preheat your oven to 240degrees for the duck and put the duck in the oven – see below. 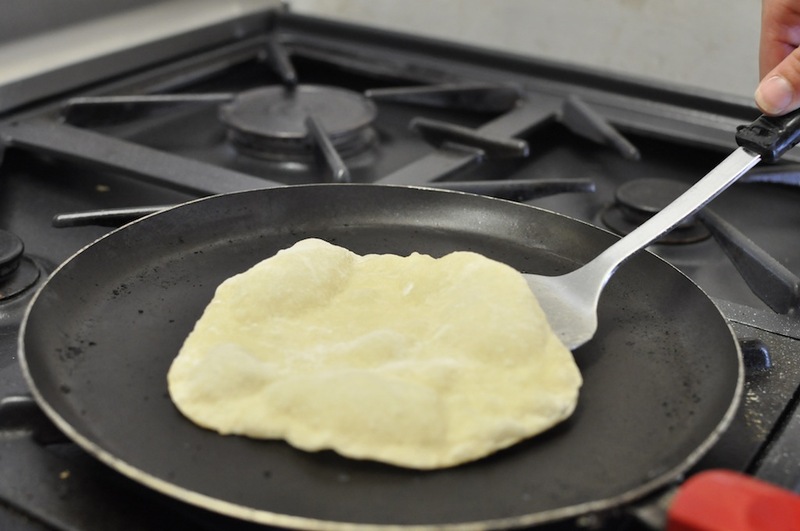 so – heat a crepe pan and put the flattened dough onto it – no oil or anything, just dry – It will start to ‘blow up’ like a balloon, flip it over when there are a few light brown spots on the cooked side, let the other side develop a few spots and put onto a plate. Get the next one onto the crepe pan. Now – before the one in the pan burns – you have to split the one you just finished into 2 pancakes. You will burn your fingers, but if you’ve done it right it’s not too hard. Continue until all the pancakes are made… yes, this is the only hard bit. Like I say.. Get someone else to do it!!! Breasts – skin side up. Pour in about 1/2 the reserved marinade – do not cover the skin if breast, should be about 10mm deep. Oven should be pre heated to 240C… Put it in the oven with fan and grille on and cook for 15 minutes. Turn it down to 180degreesa and turn off grille. If the liquid cooks off, add more marinade to keep it moist. 2. Salt and pepper – crush equal quantities of GOOD pepper corns and GOOD rock salt in a mortar and pestle and put in a dish – to be sprinkled with fingers. 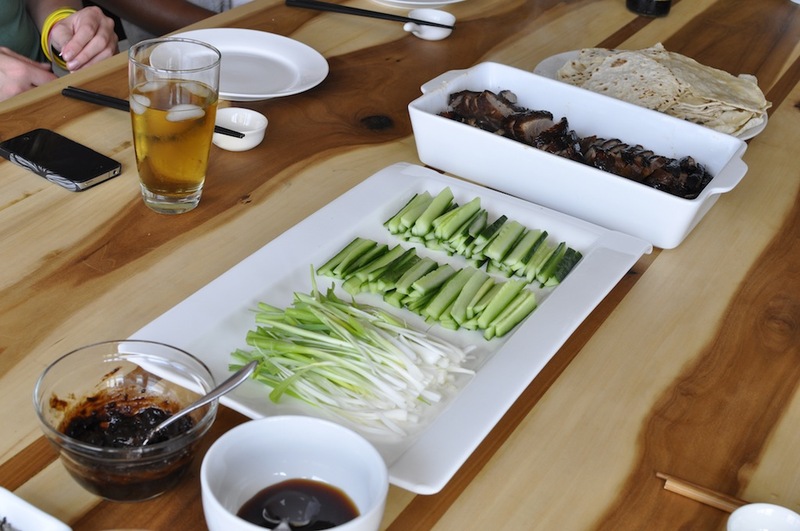 using chopsticks (or fingers…) you take a pancake, place it on your plate, put a few slivers of spring onion and cucumber on it, add a couple of slices of duck and dress with condiment to taste… roll it up and eat! seriously, after that lot, you have to be kidding me, get your guests to bring desert. In this case my beloved li’l girl made us Malva pudding and custard!!! Seems an extreme oversight that I’ve never had duck pancakes before. Yum! Oh cool, I got comments!!! I’ve been looking with avarice at your sourdough… something to test very soon! It is a very serious oversight to not have had duck pancakes! Nice, I never had duck. I think I must convince my husband to slave over this. never having had duck is a crime. Far to delicious to have missed out on, give the slave a good flogging and set him to work! Looks quite tasty in the end!!! more comments!! goodie!!! Lovely part of the world you live in! Well, methinks this actually takes more time to read than to do! Have had the ‘proper’ Chinese thing in situ many a time, but haven’t tried myself . . hmmm! Kind of fun if you have weekend houseguests whom you can entice with a glass of red to do ‘the chores’ and enjoy the results . . . with duck breasts to make matters easier . . . 🙂 ! Put ’em to work I say!! Duck looks so juicy and delicious! thanks for the comments, I see I’m going to have to do another post here! Reminded me of visits to China, first time we rolled the pancakes with out fingers like any gross western tourists. By the time I had been there for a while, I could select, assemble, roll and eat the whole thing with my chopsticks. Thanks for the comment – I’ve just been drooling over some of your posts! Fabulous – what a beautiful way of recreating a Chinese classic. 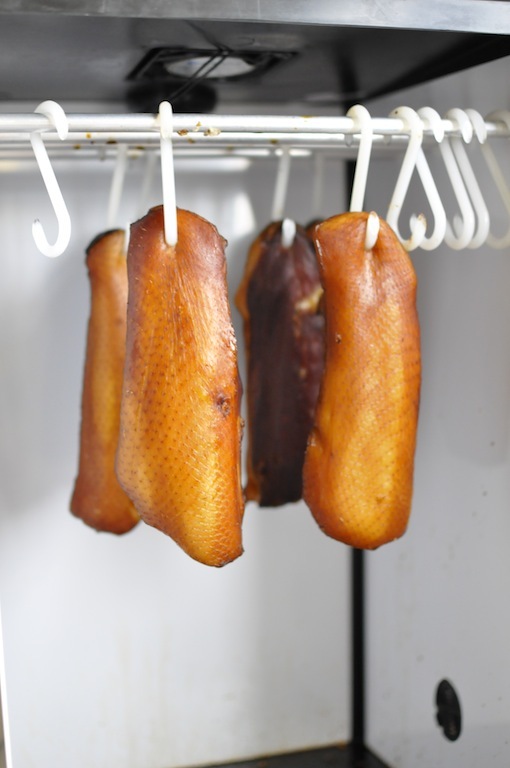 I have a pal who makes it quite often too and she dries the duck overnight int he fridge then hangs it up and blasts it for 20 mins with her hairdryer. Really does work! the hairdryer is a fantastic idea! something to try out! as is your mussels with chorizo… definitley something I’ll be making, looks superb! Hello Alex, Wow this is a superb dish! You put so much effort and prep into this dish! I will have to stop by your blog to give you a visit. Tandy, make sure to overindulge in all the food and wine of plenty. Have some for me too. HI BAM, Alex has been convinced to blog on my bog instead of starting his own and I hope he sticks to that as it is so nice to have a different approach here 🙂 I always over indulge when Alex is around! Tandy doesn’t need much invitation for a second helping ! I’ll put some more stuff up here soon, thanks for the comment!